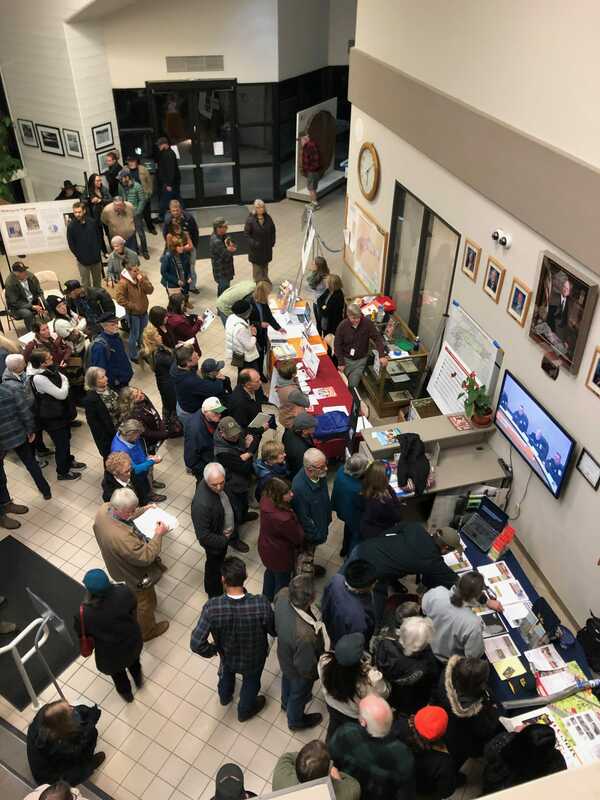 NEVADA CITY, Calif. December 5, 2018 – The Wildfire Prevention and Preparedness Town Hall held at Nevada County’s Rood Center drew an estimated 450 residents – the largest crowd for a public meeting at this venue – eager to hear answers from an expert panel. 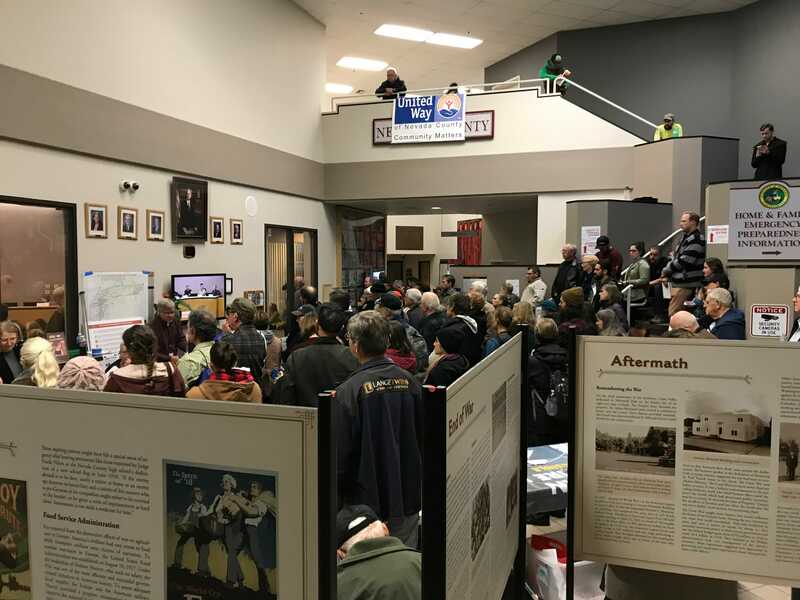 With the BOS Chamber filled to capacity as soon as the doors opened at 5:30 pm, conference rooms in the building were opened to accommodate the overflow crowd wanting to listen to and ask questions of fire, law enforcement and county staff. CAL FIRE Interim Unit Chief Brian Estes kicked off the evening by presenting a sobering assessment of the recent fires, noting that California’s largest fire (the Mendocino Complex) and the most destructive (Camp Fire) both took place this year. He recalled the slogan “You provide the defense, we provide the offense” was coined 15 years ago, but that now more than ever residents and agencies need to do more and work together. Sheriff-Elect Shannan Moon emphasized the importance of following evacuation advisories and warnings, explaining that being prepared for emergencies is now part of living in this area. She also talked about the beneficial changes in cooperation between law enforcement and firefighters that reduce response times and make more resources available during the initial attack phase of a fire. Nevada County OES Director Steve Monaghan was pleased to see a majority of the audience had signed up with the county’s Code Red emergency notification system. He reminded everyone that in case of a fire or power outage cordless phones might not work, but an “old-fashioned” corded phone and a battery-operated radio will keep you connected and informed. Grass Valley Police Chief Alex Gammelgard gave an overview of the mutual aid system, explaining how in case of an emergency every available resource from all agencies will converge on the incident – noting that, if needed, out-of-county resources can be called upon. Grass Valley Fire Division Chief Sam Goodspeed focused on Nevada City, his response area, detailing the fuel reduction work accomplished on city properties and the plans for the coming year. Nevada City will accelerate their outreach to the community through social media, their website and newsletters. Grass Valley Fire Chief Mark Buttron illustrated the cooperation between agencies and the model that is the CUnique in the nation, the system draws on local, state and federal resources – sending strike teams composed of different local departments to incidents when needed while maintaining full coverage of each department’s response area. CHP Grass Valley Commander Lt. George Steffenson spoke very highly of all Nevada County first responder agencies and their dedication to a common mission. He provided details on how short-term and long-term road closures are being decided on and handled by CHP. Nevada County Consolidated Chief Jim Turner explained the importance of accessible driveways and fuels management on private properties. Standard driveways should be at least 10 ft wide with a 1-ft shoulder on each side and have at least 15-ft in vertical clearance. This allows for easy access by a fire engine and rapid egress of residents in case of an evacuation. He reassured the audience that managing fuels on a property does not require the removal of all trees, brush removal, trimming low branches and breaking up the canopy are important mitigation measures. Nevada County Public Works Director Trisha Tillotson shared her plans for aggressive roadside vegetation management on county-maintained roads, pointing to the ongoing work on North Bloomfield and connecting county roads. More tree and brush removal on these critical roads is ongoing, with more grant funding requested to treat a total of 400 miles of county roads. The panelists were not the only agency representatives. All five members of the Board of Supervisors attended the meeting, either at the Rood Center or at the conference room in Truckee. Grass Valley City Council members Lisa Swarthout, Jan Arbuckle and Ben Aguilar, Nevada City Council members Erin Minett and Reinette Senum, firefighters and chiefs for Higgins Fire, North San Juan Fire, Washington Fire, Grass Valley ECC (dispatch), Grass Valley Air Base, the city managers for Nevada City and Grass Valley and Nevada County CEO Alison Lehman were in attendance. The second part of the Town Hall was devoted to questions and comments from the public. Questions regarding vacant parcels, neighbors neglecting defensible space, evacuation procedures, clearance around propane tanks along with suggestions for the widening of Hwy 49 and 20, the possibility of using sirens as emergency notification systems, the launch of a goat-grazing initiative in Nevada City and the need for collaboration with State Parks are only a few of the topics discussed. We are compiling a list of questions and answers to be published alongside the Nevada County Wildfire Issues map in the coming days. Meanwhile in the lobby, Cal Fire, Connecting Point and their 211 service who signed up many people to receive Code Red notifications, Nevada County OES, Building, Code Compliance, Public Health, Adult Services, the Fire Safe Council of Nevada County, the Fire Safe Coalition, the Nevada County Resource Conservation District, FREED, the UC Cooperative Extension, the Nevada County Superintendent of Schools and the Nevada Irrigation District were on hand to answer specific questions and provide information on available resources. The meeting was live broadcast on KVMR FM and NCTV, video and audio archives will be available in the coming days. Cheif Turner mentioned accessible driveways/fuel magmnt on private lands, but how are they to going to make sure this is done with landowners who refuse?. We have 2 such landowners at the end if our street who will not comply and are putting our lives on the line as they are too stupid or too stubborn to care. What are our options with these irresponsible people?